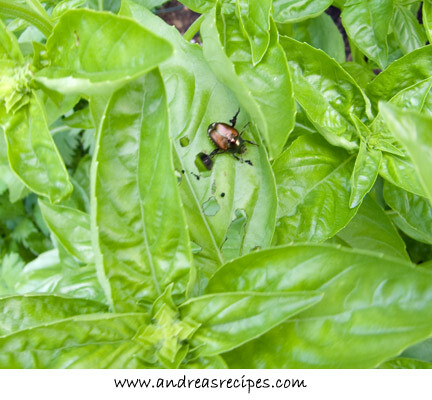 Japanese beetles can be the bane of any garden, and basil is one of their favorite foods. This specimen was happily munching away on the precious leaves, but not for much longer after this photo was taken. We keep an organic garden, no pesticides allowed, so the best option for dealing with them is deterrent. After we kill them, we leave their carcasses laying around the plants to discourage others from snacking. We don’t use the bag traps because of studies that show they are relatively ineffective.